In the summer of 2004, on a car journey in Eastern Europe, Pavla Fleischer met and fell in love with Eugene Hutz, lead singer of New York's Gypsy Punk band Gogol Bordello. Captivated by his energy and his musical verve, and desperate to get to know him better, she decided to make a film about him. 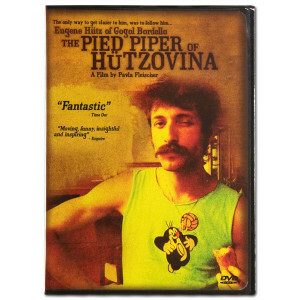 The Pied Piper of Hutzovina follows Eugene and Pavla on their subsequent road trip through Eugene's home country, Ukraine. It is the story of two people traveling together on two very different courses. Her aim is to rediscover a forgotten romance; his is to rediscover his roots. She hopes to find love on the road; he hopes to find musical inspiration from the gypsy culture he is determined to preserve. This is an intimate portrait of a filmmaker with a passion for her subject, and a punk musician with a longing to revisit his past. Theirs is a journey which tests their relationship and challenges their perceptions of the music they both love. VERY insightful movie/documentary going back to Eugene's roots in the Ukraine.VERY touching,funny and great music all in this film.Highly recommended to any Gogol Bordello fan.